We’d love your help. Let us know what’s wrong with this preview of Crone of War by Heather Poinsett Dunbar. The Lamia expeditionary force has gained a foothold in Éire and has formed an alliance with a powerful Irish chieftain and his malevolent mother. To reinforce them, a massive Lamia army, which is departing Rome, will soon give them enough power to conquer Eire and find their lost treasure. Will the Deargh Du and their new found friends be able to protect Eire from the invaders, or will the Deargh Du’s suspicion of other blood-drinkers allow their enemies to be victorious? To ask other readers questions about Crone of War, please sign up. TITLE OF BLOG POST: "Sensational Paranormal Details"
Someone stole the "phallus maximus" from a sacred statue and now everyone's on a serious quest to find that enormous sexual organ (including different strains of vampires). Such subtle humor, coupled with all this book's sensational paranormal details, is what makes this book extremely entertaining and fun to read. The writers certainly did their research to make this story feel very authentic and exciting. Adoration aside, history reminds us how violent humans can be, and the Dunbars describe that sordid past, perfectly. I nearly squeezed my eyes shut a few times while reading. That's thanks (in part) to a grotesque but believable portrayal where more than one rather likable vampire, a Deargh Du, is tortured, Spanish Inquisition style. page 32 - The priests begin throwing holy water on a Lamia vampire, in an attempt to banish him from their temple, as though he were merely "a demon." In reply, the Lamia merely blinks, and yells: "Stop that!" page 43 - After a vampire "adopts" a recently orphaned teenage girl, he insists:"Berti, go to sleep, or I will toss you overboard," then quiet's his own laughter. page 39: Regarding a clan leader as she addresses a Dearg Du vampire who is also an arch Druid: "Wait." Mael Muire stood up and walked over to Ruari. She pulled on her sleeve, baring her right arm. "Do you require nourishment?" Carrying a wooden crucifix, a Lamia vampire (*former nun*) reflects back on the day she was resurrected: "Mandubratius pulled me from my convent one night, and he gave me no choice in the matter. He wanted me, so he took me. That was all there was to it. He promised me power in exchange for my obedience. It was that or death. Unlike a good Christian martyr, I begged for my life. He took my life and gave me a new one." She shrugged, staring into the small pain-stricken figure on the cross. "I suppose it is kind of funny. Jesus Christ promised me life after death, and now I have it." page 14 - "A strange, pale figure walked toward the few remaining pirates, and then all turned dark again." Interestingly, just as the adjective "dark" refers to "an absence of light or clarity," my mind went completely dim, as it always does when I read sentences where the adjective does not describe either noun expressed in the sentence. page: 31 - "The twenty monks grabbed weapons and holy water. They then started surrounded Assim." "Surrounded" should have been "surrounding." Again, in spite of an occasionally bumpy ride to jolt the reader out of the relaxing escape that only reclining with a good book can provide, I still highly recommend "Morrigan's Brood: Crone of War" for all of the positive reasons I have already mentioned. Really. Definitely. I recommend this book (because you won't stop thinking about the plot or main characters after you've finished reading)! It's definitely a worth-while and addictive read. 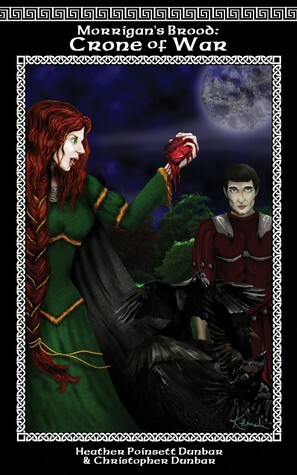 Crone of War takes off where Morrigan's Brood ended. Marcus and his companions are trying to find an ancient relic before his enemy Mandubratius. Marcus is a Deargh Du and Mandubratius is a Lamia. They are both immortal blood drinkers but if the evil Mandubratius finds what his people have spent 600 years looking for, they could gain the power to rule over all. Elsewhere, Mael Muire is the new chieftain of her people but there are others lurking in the shadows that want her power and land. The L Crone of War takes off where Morrigan's Brood ended. Marcus and his companions are trying to find an ancient relic before his enemy Mandubratius. Marcus is a Deargh Du and Mandubratius is a Lamia. They are both immortal blood drinkers but if the evil Mandubratius finds what his people have spent 600 years looking for, they could gain the power to rule over all. Elsewhere, Mael Muire is the new chieftain of her people but there are others lurking in the shadows that want her power and land. The Lamia have formed alliance with a neighboring chieftain that will do anything to have her son wed Mael. Mael and Marcus are reunited again when Marcus' search brings him back to the land of Eire and straight into battle with the Lamia. I was glad to read more of Mael Muire. She is often described as hard headed, which she is, but she is also strong, determined, smart and cares a great deal about her people. The former Roman General Marcus is just as wonderful as he is in the first book and Mandubratius is depraved and bent on gaining power as ever. A favorite character of mine is Bertius Lancastrius, or Berti. He is a fun character that adds humor to a book that can be at very dark at times. Rome is not the great power it once was but Mandubratius seeks to change that with him at the helm of power. Morrigan's Brood: Crone of War is just as well written and full of memorable characters as the first book in the series. This is no quick read but an adventure that is full of surprises and unexpected turns. The detail in which the authors describe the places and events is great. Something else I liked was that there is a map of every where the events occur, detailed list of all the lines of blood drinkers and where they originate from and if you are like me and can't figure out how to pronounce a name, there is even a list of the characters name and how to pronounce each one. If you have not read the first one, you can also read this. The action will be clear enough and the more you may lose is a reference, but you can understand what's going on perfectly. I won this book from First Reads. I recieved both this book and the first book in the series. I loved them both. The first book did a great job establishing the main character and I loved the way the second book story line flowed. I enjoyed the take on our world/history with these new types of vampires and the history of them. Thank you, it was a wonderful read. I recieved this book when i won Book 3 in a good reads contest. This book has a great story line and is a great read. I look forward to the other books in this line. Excellent continuation of the Morrigan's Brood series. This series strikes a perfect balance - wink wink, nudge nudge. It is historical without being pedantic, dramatic without being bleak, and humorous without being ridiculous... Okay, so it is a little ridiculous. After all, the mad Lamia are tearing the world apart looking for a magical giant stone phallus. But hey, they're mad. Despite the weirdness of the villains' aims, the means they're willing to use to achieve their ends remain dark and Excellent continuation of the Morrigan's Brood series. This series strikes a perfect balance - wink wink, nudge nudge. It is historical without being pedantic, dramatic without being bleak, and humorous without being ridiculous... Okay, so it is a little ridiculous. After all, the mad Lamia are tearing the world apart looking for a magical giant stone phallus. But hey, they're mad. Despite the weirdness of the villains' aims, the means they're willing to use to achieve their ends remain dark and brutal enough to keep the villainy real. Awesome ! I love it, the idea of different races of vampires from different cultures with different strengths and weaknesses just amazing. This review has been hidden because it contains spoilers. To view it, click here. I am one of the co-authors of this novel, so I won't actually post a review. But I will say that this second novel in the Morrigan's Brood Series answers many questions about the main characters, such as "will Mandubratius find his treasure", "will Mael Muire get married", "will Marcus find Mandubratius before it is too late", and "will Mandubratius ever shut up". I hope our readers will like this new installment as much as, if not better than, the first novel in the series. I also hope our reade I am one of the co-authors of this novel, so I won't actually post a review. But I will say that this second novel in the Morrigan's Brood Series answers many questions about the main characters, such as "will Mandubratius find his treasure", "will Mael Muire get married", "will Marcus find Mandubratius before it is too late", and "will Mandubratius ever shut up". I hope our readers will like this new installment as much as, if not better than, the first novel in the series. I also hope our readers will be pleased that the next three novels in the series are written, in queue for publication, and that two to three additional titles are being written. This took me quite awhile to read as I couldn't get into it. It was better than book 1 less history and no jumping between time periods. But I found if I left it for a few days I had to re-read the previous chapter to get back into the swing so to speak. Don't hink I'll be reading any more of he series because its not the type of book I would seek out.